Goodwill® is a not-for-profit organization committed to providing jobs and training for people to gain skills and achieve independence. Sometimes these are individuals who face specific challenges, such as language barriers, or physical or cognitive disabilities. But often the people that seek our services are those whose lives have been affected by plant closings, company downsizing, or simply the impact of a difficult economy. Our programs can help anyone who needs to find employment. Learn more about our programs HERE. As a non-profit organization, your donations are tax-deductible. Governing documents and annual reports are available upon request. Please call (520) 623-5174 ext. 1119 for information or see our Annual Reports HERE. Goodwill® Industries was founded by Dr. Edgar J. Helms, a Methodist minister and early social innovator from Boston. Helms collected used household goods and clothing, then hired and trained people who were poor to repair the items. The goods were resold, and employee wages were paid from the revenues generated. To view a slideshow of Goodwill’s history, please click HERE. Who started Goodwill® Industries of Southern Arizona? There are 163 independently-run Goodwill regions across North America and Canada. Goodwill® of Tucson, was founded by Methodist pastor, Dale Dunbar in 1967. Pastor Dunbar was an advocate of the Tucson community and its poor. People donate their gently used goods to us, we sell it in our thrift stores and other retail operations, and we use our retail revenue as well as other income sources to open doorways for community members who need employment. Through our programs and services, we offer a hand up, not a hand out by working with individuals to gain the skills to find and keep employment and to realize the potential for each person to meet his/her career and educational goals. 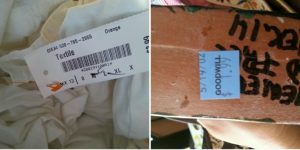 Are all Goodwills® the same? No. There are 163 autonomously-run Goodwill® regions in North America and Canada. Each Goodwill® region has its own local, volunteer Board of Directors and its own Management team. Although all are committed to changing lives through the power of work, each serves local needs by developing programs and services specific to their communities. Every Goodwill® region runs its thrift operations differently as well. Goodwill® Industries of Southern Arizona schedules its own hours, sales and discounts separately from other Goodwill® of Central and Northern Arizona. Find Goodwill® of Southern Arizona’s store locations HERE. Goodwill® Industries International provides Goodwill® regions consultation and support but they do not have a hand in the day-to-day operations. Where is Goodwill® of Southern Arizona’s headquarters? Does Goodwill® give away clothes? No, Goodwill® does not give away clothes or other items to individuals. Goodwill® charges very reasonable prices for clothing and other goods. The revenue helps pay for the programs, employment and other services we provide. Goodwill® may support other community organizations through in-kind donations and each request is reviewed on a case-by-case basis. I am a member of an organization looking for donations. Who do I send a donation request to? Each request is reviewed on a case-by-case basis. Requests should be made by an officer of your organization and on letterhead. Please send your request to crussell@goodwilltucson.org or by mail, Attn: Executive Assistant. Goodwill® also partners with other non-profit community organizations by providing store vouchers. Partner organizations will distribute those vouchers per its own guidelines. We will refer individuals that need free clothing to those community organizations. For more information, please call (520) 623-5174 ext. 1119. Goodwill® thrift stores and Good Threads Boutique will provide in-store credit for clothing that is returned within 7 days of purchase as long as tags are intact and receipt is provided. All other items are sold as-is. Items purchased at our Outlets and Auction are sold AS-IS and all sales are FINAL. For items purchased on shopgoodwill.com – All items are sold AS-IS and all sales are FINAL. Do I pay sales tax in your stores? No. Goodwill® Industries of Southern Arizona holds 501c(3) status and is a non-profit organization. When you shop at Goodwill® of Southern Arizona thrift stores and Boutique, you don’t pay taxes! Anyone who wants to save money and help fund our services may shop at a Goodwill® store. People of all incomes and all walks of life shop our stores frequently. Can I purchase a gift card to Goodwill® stores? Yes, you can purchase a gift card to use at any of Goodwill® of Southern Arizona thrift stores and Good Threads Boutiques. There is no expiration date. Please find the nearest store HERE! Please note: Gift cards purchased at Goodwill® of Southern Arizona stores are only valid at stores in Southern Arizona. There IS NOT a universal Goodwill® gift card available. Customers are not able to purchase gift cards online at this time. Please find your nearest Goodwill® store here! What types of items can I buy at shopgoodwill.com? There are many treasures you can find on shopgoodwill.com. This can range from jewelry, artwork, musical instruments, etc. Shopgoodwill.com lists items from Goodwills® across the country! Does Goodwill® stores in Southern Arizona honor discount coupons from other Goodwills® in Arizona? Goodwill® of Southern Arizona runs independently from other Goodwills® in Arizona, so the discounts don’t cross over. However, stores operated by Goodwill® of Southern Arizona offer discounts every day! Our Color of the Week gives you 50% off specific-colored tags. See Color of the Week Calendar Color of the Week. Discount applies only to donated goods. Other restrictions apply. See store for details. 20% off Hero Discount on Sundays and Mondays. Military, Fire, Police, EMT/EMS first responders are all eligible. Present a badge or ID card to claim your discount. 20% off Senior Discount on Tuesdays and Wednesdays. Please present a Goodwill Senior Discount card to the cashier. 20% off Teacher Discount on Thursdays and Friday. Teachers please present your Tucson Values Teachers discount card to the cashier. 20% off discounts for students with a College ID*, everyday! *Valid ONLY at the 4th Avenue store and the GoodThreads Boutique on N. Oracle. *Discounts above, valid on donated items only. Outlet locations excluded. Throughout the year, we also hold 50% off sale days. This discount applies only to donated goods. To be informed about our sale days, follow us on facebook.com/goodwillsouthernaz or sign up for our email blasts here. How often does inventory change? Thousands of items arrive at each of our stores every day. Our brisk turnover of goods means you can shop us regularly and always find something different! What happens to the items I donate in donation bins? Goodwill® of Southern Arizona currently DOES NOT have unattended donation bins. We have over 40 locations in Southern Arizona where you will receive assistance by a uniformed Donation Attendant. We pride ourselves in being able to give this customer service and you can feel confident that your donations go directly to our organization to support our mission. For the nearest Attended Donation Centers near you, click HERE. How do I value my donated items for tax deductions? Thank you for donating to Goodwill®! By law, Goodwill® cannot tell you what your donated items are worth but you as the donor can determine the ‘fair market value’ of the clothing, household goods, used furniture, books, etc. The ‘fair market value’ of an item is dependent on the condition of the item as well as the price a willing buyer would pay for the item. You can also consult with a tax advisor or review the IRS guidelines for determining the ‘fair market value’ for donated goods, property, etc. We are also happy to offer a “Donation Value Guide” that provides the average prices in our stores for items in good condition. If you are donating a vehicle to Goodwill®, we follow all IRS guidelines to provide you a tax form, if applicable. What things can I donate? What don’t you accept? We are able to accept most items you’d like to donate to Goodwill®. However, due to some regulations, handling and safety issues, we are unable to accept the items listed HERE. We also accept vehicle donations and monetary donations. See other ways to DO GOOD by donating, HERE. Does Goodwill® sell everything it receives from donors? Not necessarily. We do try to find the highest use for every material dropped off at our donation sites. Most items are sold in our thrift stores, outlets, boutique, or online. In FY2017-2018, we collected over 28.3 million pounds of donations. We do sometimes receive donations that are unsellable and we properly recycle or dispose of these items. When we have to dispose of items, Goodwill® incurs these expenses which then takes away from our mission. Please see list of items we cannot accept HERE. Through our Youth Restoration Project, we take some of the furniture and bikes donated and our former youth participants, now hired as full time employees, give it a new life by refurbishing, repurposing or repairing the pieces. These are then sold in our retail stores. Through an alliance with Dell Computer, donated computer equipment is responsibly salvaged, pieces recycled, and not shipped abroad and burned to extract precious metals. Learn more HERE. Do Goodwill® employees get first dibs on donated merchandise? No – absolutely not. At all donation and thrift store locations, we promise to protect the value of the donations that community members generously donate to us. Employees are NOT ALLOWED to set aside merchandise nor can they purchase items until it has been on the floor for a period of 48 hours. How can I help Goodwill®? As a non-profit organization, we welcome financial contributions and the donation of gently used items from corporate and individual donors who believe in our mission. Donations are the economic engine that allows Goodwill® to be able to fund some of our programs without needing to rely on grants or other funding sources. If you’d like to give a tax-deductible monetary donations, please click HERE. You can also learn what impact your donation has on our program participants by clicking HERE. We also appreciate your time – if you’d like to get involved by volunteering with Goodwill, please visit and fill out our Volunteer Form, HERE. My club or organization would like to organize a donation drive for Goodwill®. Who should we contact? Please call (520) 623-5174 ext. 1157. We would love to partner with you to do a donation drive. Thank you! Why should I give money to Goodwill®? Giving to Goodwill® is an investment in the future of our community. We are helping people in the greatest need become self-sufficient, who contribute to the support of their families and society. We are an engine of job growth in the local economy. Your contribution will have a direct impact on our ability to serve more people in need through our mission. Please take the time to look through our Program & Services pages or call the phone number provided to speak with someone in the program to learn more about the people we help and the opportunities people receive. If you’d like to give a tax-deductible monetary donation, please click here. How do I apply for a job at Goodwill®? We are only accepting online applications and all of our available job positions are available at www.GoodwillSouthernAZ.org/current-openings. Please click on the job that you are interested in and an online application will open on your window. Please be sure to provide an active email address as all correspondence regarding your application will be sent via email. If you need assistance filling out the online application, please visit one of our Job Connection Centers and our Career Development Specialist can assist you or call (520) 623-5174. How do I check the status of my job application? All status updates are provided to the email listed in your job application, so it is very important that you enter an email that you check regularly. If we are unable to reach you by email, we will attempt to call the phone number provided. What kind of opportunities does Goodwill® provide to be promoted within the organization? Goodwill® has a robust training program that employees can take part in to get a pay raise and to move up in our organization. Employees also have access to our Employee Development Program where they can get assistance creating a Career Plan and follow-through on the steps to progress on their career and educational goals. Why does Goodwill only hire for full-time positions? Goodwill is proud to be able to offer full-time jobs with benefits. We believe that consistent work equals a stable and strong workforce. Full-time employment is part of our mission. If I am a former employee of Goodwill, who do I contact to update my address for my W-2s? Addresses can be updated by calling (520) 623-5174. The Receptionist will request a few other pieces of information to ensure we will be updating the correct record like your name (or maiden name) and the last 4 digits of your social security number. Can anyone use your programs and services? Some of our Programs have certain requirements to be eligible to participate. These requirements can be found on each program’s webpage. A phone number is also provided if you would like to speak with someone from the program. The use of our Job Connection Centers is OPEN TO ALL! The Job Connection Center are community-based resources funded solely by the donations/sales from our retail stores. All locations offer access to computers with internet, phones, fax, copier and printer. The centers are staffed with on-site Career Development Specialists who can offer guidance and assistance in the areas of basic computer skills, employment, education and/or community resources. Services are on a walk-in-basis, no appointments are necessary. Click HERE to learn more and to find your nearest Job Connection location. If there are programs or services you are looking for that Goodwill® does not operate, we have a list of Community Resources that any program or retail employee can direct you to. Do the young adults who work in the Youth Restoration Project get paid? Yes. The young adults who are employed through the Youth Restoration Project are full-time, paid Goodwill employees and they enjoy the same benefits the rest of our employees do. Are all youth and young adults who participate in your youth programs given some type of compensation? Depending on the type of program youth participants ages 18+ are enrolled in, some are eligible for some type of compensation. Please visit each program’s webpage or call the program contacts for further details. If I sign up to receive Goodwill® emails, will Goodwill® sell my email address to a third party? No. Goodwill®’s email list is managed in-house and we will NEVER sell your email address to a third party. How many emails will I get each month? You may receive an email about our sales, events, announcements and program stories 1-2 times per month. How do I ‘unsubscribe’ to the email list? I am not receiving the email blasts, how do I re-subscribe? These emails may post in your ‘Junk’ mailbox, please use your email settings to accept emails from ‘Goodwill Industries of Southern Arizona’ or ‘Goodwill GoodThreads Boutique’. To re-subscribe to the email list, please click on the “Join our email list” icon at the top-right corner of the website. Please note: Goodwill® Industries of Southern Arizona is not responsible for the misuse of this site’s legally protected content. Goodwill® Industries of Southern Arizona is not responsible for harm or loss that results from use of the site.